Using cutting-edge virtual reality technology, researchers have ‘beamed’ a person into a rat facility allowing the rat and human to interact with each other on the same scale. Published today in PLOS ONE, the research enables the rat to interact with a rat-sized robot controlled by a human participant in a different location. 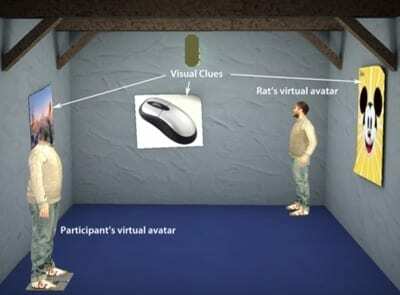 At the same time, the human participant (who is in a virtual environment) interacts with a human-sized avatar that is controlled by the movements of the distant rat. The authors hope the new technology will be used to study animal behaviour in a completely new way. Computer scientists at UCL and the University of Barcelona have been working on the idea of ‘beaming’ for some time now, having last year digitally beamed a scientist in Barcelona to London to be interviewed by a journalist. The researchers define ‘beaming’ as digitally transporting a representation of yourself to a distant place, where you can interact with the people there as if you were there. This is achieved through a combination of virtual reality and teleoperator systems. The visitor to the remote place (the destination) is represented there ideally by a physical robot. During the human-animal beaming process the human participants in the system were in a virtual reality lab at the Mundet campus of the University of Barcelona. The rat was located around 12 km away in an animal care facility in Bellvitge. Tracking technology was used to track the movements of the rat in its arena, and the tracking data was transmitted over the internet to the computers running the virtual reality simulation in Mundet. This tracking information was used to control a virtual human character (an avatar) that represented the rat so that whenever the rat moved its avatar moved too, in a representation of the rat arena but scaled up to human size. Hence the human participant shared the virtual arena, which looked like a room with some pictures on the walls, with a humanoid avatar. The movements of the human in the virtual reality were also tracked, and the data sent to computers in Bellvitge that controlled a small robot that was located in the rat arena. Whenever the human moved in the virtual space the robot moved in the rat space. Putting all this together – the rat interacted with a rat sized robot that represented the remotely located human, and the human interacted with a human sized avatar that represented the remotely located rat.